[G]reen Eco Warriors Youth Initiative fosters leadership skills, scientific learning, environmental conservation, and scholastic success. 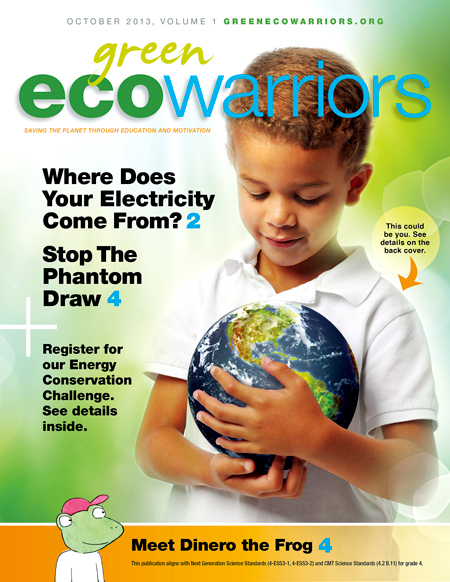 The Green Eco Warriors offer resources including books, magazines, DVDs, and live presentations for youth, teachers, schools, homes, families, groups, and communities to help begin the journey toward energy savings and protecting natural resources. In September of 2012 the Green Eco Warriors developed Dinero the Frog Learns to Save Energy, The Phantom Draw, and the Save Energy Save Dinero Pledge. Their goal is to reduce carbon emissions and pollution through Education and Motivation. All Green Eco Warriors lessons align with CMT and National Science standards, incorporating environmental, health, and social perspectives in an engaging format which children can easily comprehend. For a free consultation regarding sustainability education or an in-school presentation, contact the Green Eco Warriors at 860-580-9076.